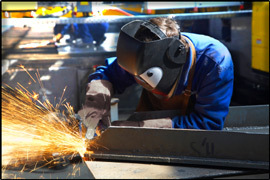 Fully-written Fabrication Shop Quality Plans & Manuals range in size between 30 pages and over 200 pages. — Good for steel fabricators and erectors, pipe fabricators, and piping and pipeline companies. As well as, companies that use certified welders and certified welding inspectors and must meet AISC Certification requirements. Plans and Manuals are available to meet commercial, civil, industrial, and government project requirements including USACE/NAVFAC, FHWA, FTA/DOT and city, state or local agencies. As well as, ISO 9001 and ISNetworld standards. We'll prepare a Quality Plan and/or Manual based on your project requirements and personalize it with your company name, logo, and contract information. Download a Fabrication Quality Plan Sample, and see what you'll get in each section of your fabrication quality plan. Or, contact us at 410-451-8006 and we'll answer all of your questions.